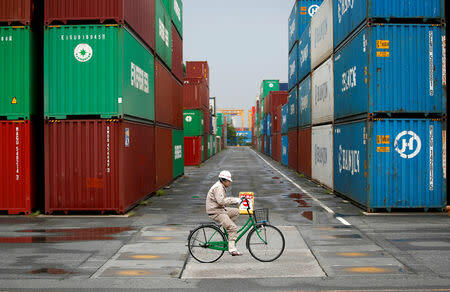 TOKYO (Reuters) - Japan's exports fell in September for the first time since 2016 as shipments to the United States and China declined, likely impeding third quarter economic growth and adding to concerns about the broadening impact of an escalating Sino-U.S. trade war. The data comes days after a Reuters poll showed a third of Japanese companies - not just exporters - have been affected by the trade conflict between the world's two biggest economies, and more than half worried about its fallout on their business. Japanese policymakers also remain wary about the overall economic impact of the international trade frictions. A string of natural disasters that struck Japan has added to the strain on factories, disrupting output and physical distribution. The U.S.-Sino tariff row has yet to materially hurt trade activity, but a slowdown in external demand has bolstered views that Japan's economy, the world's third largest, likely slowed sharply in the July-September quarter. "The economy probably grew only slightly in the third quarter, led by firm consumption and brisk capex. External demand likely made no contribution," said Takeshi Minami, chief economist at Norinchukin Research Institute. "Assuming the U.S.-China trade frictions have widespread effects on global trade, Japan's exports will struggle to grow." Minami said declines in shipments to the United States and China - the two key export destinations for Japan - are a source of concern as each of them accounts for about 20 percent of Japanese exports, respectively. Ministry of Finance (MOF) data out on Thursday showed Japanese exports fell 1.2 percent in September from a year earlier, against a 1.9 percent increase expected by economists in a Reuters poll, and followed a 6.6 percent gain in August. In volume terms, exports fell 4.8 percent in the year to September, the first drop in seven months. Japan's exports to the United States declined 0.2 percent in the year to September, dragged down by falling shipments of construction and mining machinery, auto parts and medicines. U.S.-bound auto exports amounted to some 143,000 cars, down 7.0 percent year-on-year in a snapback from the previous year's brisk shipments, a sign that car sales have levelled off. Imports from the United States rose 3.1 percent in September, led by crude oil, liquefied petroleum gas, helping reduce Japan's trade surplus with the United States by 4.0 percent year-on-year to 590 billion yen (£4 billion). The U.S. Trade Representative's office told Congress on Tuesday it would open trade talks with Japan, describing the country as an important yet underperforming market for U.S. exports. Tokyo and Washington last month agreed to start trade talks in an arrangement that, for now, avoids the worst-case scenario of an imminent 25 percent tariff on cars. Trump has made clear he is unhappy with Japan's $69 billion trade surplus with the United States - nearly two-thirds of it from auto exports - and wants a two-way agreement to address it. Thursday's trade data showed exports to China, Japan's biggest trading partner, fell 1.7 percent in the year to September, the first decline in seven months, dragged down by semiconductor production equipment. Shipments to Asia, which account for more than half of Japan's overall exports, rose 0.9 percent. Overall imports rose 7.0 percent in the year to September, versus the median estimate for a 13.7 percent annual increase. "External demand has likely put a drag on Japan's economy," said Koya Miyamae, senior economist at SMBC Nikko Securities. "Going forward, exports may recover from supply constraints, but effects from slowdown in emerging markets, and the U.S.-China trade war remain a source of concern."